[tweetmeme]I recently reviewed The Magic of Black & White, Part One – Vision and now we have part two – craft. A clever set of titles if you ask me… mainly because the books are published by Craft & Vision. I gave high marks to the first book, and this one is right up there too. Author and photographer Andrew Gibson continues his discussion of black and white photography by covering some of the technical aspects and how they relate to the inspirational side of things. Like the first book, the text is concise and the images are both useful and beautiful. All together, it’s an easy read that also contains good reference material. 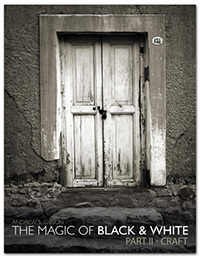 “The Magic of Black & White, Part Two – Craft” can be purchased through Craft & Vision for only $5. The links in this post are affiliate links. The Magic of Black & White, Part Two – Craft is a 51 page downloadable PDF eBook. The book is a single page landscape format (to make it easier to view for the folks with iPads and such). Throughout the book, you’re presented with a mix of philosophical and technical advice along with sample photos from Andrew’s fine collection of work. 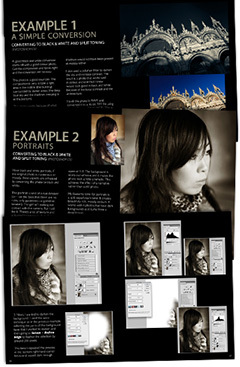 This book uses software tools found in Photoshop CS3 (or newer) and Photoshop Elements 6 (or newer). The book starts off a little slow in that it doesn’t jump right into the technical stuff. Andrew lays out some groundwork by explaining his experience and philosophy. After a few pages of this, he jumps into the main course with technical stuff from the digital darkroom. Here, Andrew goes through techniques for black & white conversion and toning. Three example studies bring us to the conclusion of the book, and they contain other useful editing tips such as masking, burning, the addition of texture, and more. Andrew Gibson is a writer and photographer based in the south of England. He works for one of the UK’s leading photography magazines and also freelances. He loves to travel and one region he’s been drawn back to time and time again is South America, in particular Argentina and the Andean regions of Bolivia and Peru. He works in a ‘fine art documentary’ style and presents most of his work in black and white. You can find Andrew’s work at his main website or at his blog. He’s also a regular contributor at Phototuts+, Smashing Magazine, and the Fine Art Photoblog. On top of all that, he’s an employee of EOS Magazine. Definitely a book worth reading for the beginner/intermediate black and white enthusiasts, especially for the low price of $5. The technical skills presented are not terribly difficult to learn, and Andrew presents them in a way that’s easy to digest. Even the more advanced photographers might pick up a thing or two since some of the techniques presented were developed by Andrew himself. Part two (craft) is a great follow-up to part one (vision), and I would certainly suggest getting this one if you liked the first. And if you didn’t get the first book, you might consider getting both because (in Andrew’s words) “craft without vision is just an exercise in pushing buttons”. “The Magic of Black & White, Part Two – Craft” can be purchased through Craft & Vision for only $5. LIMITED TIME OFFER: Use the promotional code MAGIC4 at checkout to get the book for $4 or use the code MAGIC20 to get 20% off when you buy 5 or more books from the Craft & Vision collection. These codes expire at 11:59pm PST June 1, 2010. This entry was posted in Features, Reviews and tagged andrew gibson, black and white, book, book review, craft, ebook, photography, review, vision on May 27, 2010 by Brian Auer. Thanks for the review, Brian. No problem! These are a great set of books, I really like the way you put them together.